Happy Color Play Friday everyone! It's getting close to the end of the month, closer to Halloween, and closer to the start of the busy season! At least it's the busy season for me! I hope I can keep up with Color Play Friday! 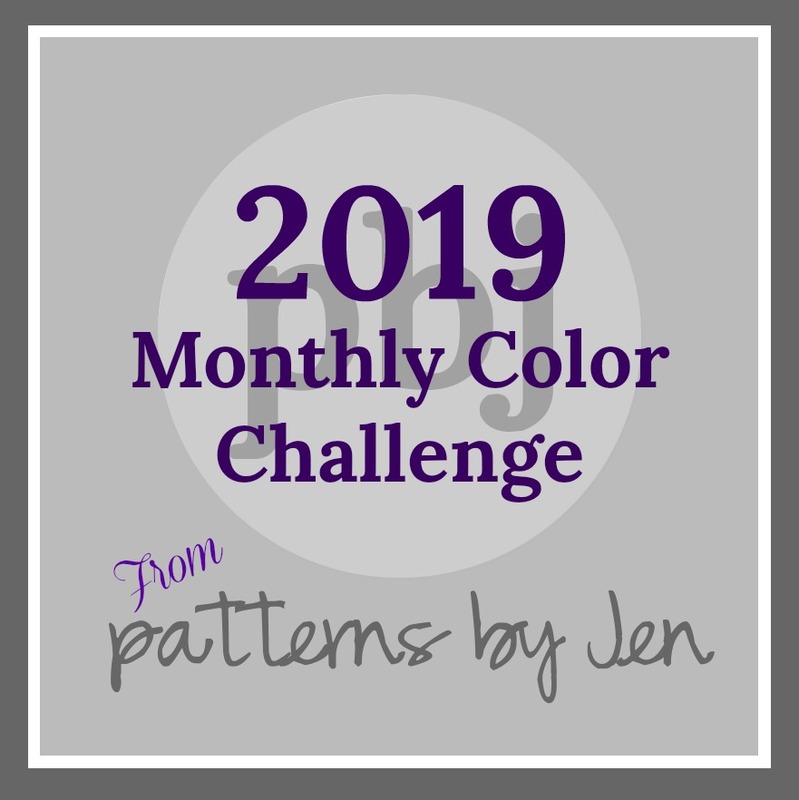 For those of you who may be new, Color Play Friday (CPF) is a fun weekly challenge hosted by Lorinda from Laurel, Poppy and Pine and Trina from In an Otter Life. 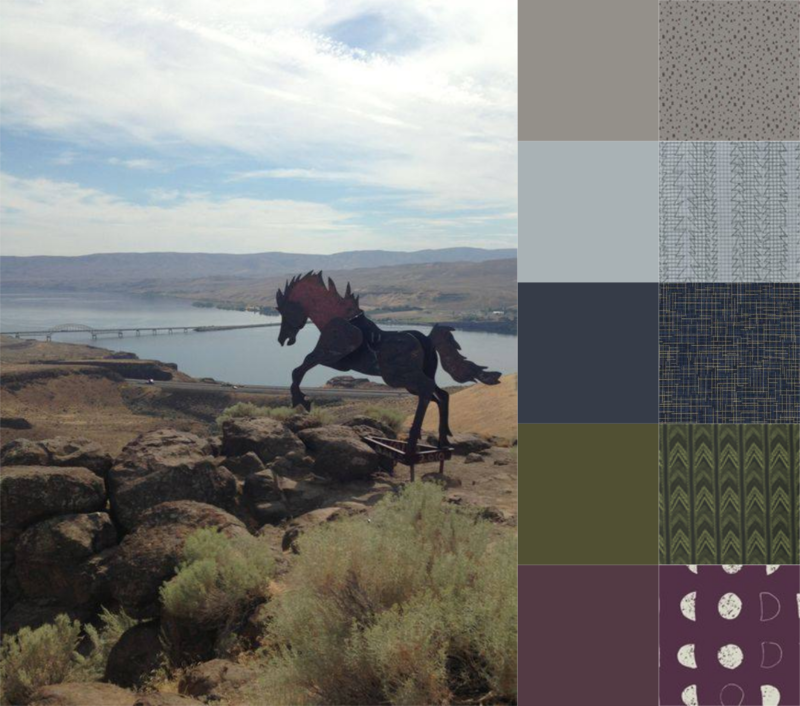 Each week they provide one of their photographs as inspiration and then the CPF participants create a color palette and a fabric bundle based on the photo. It's a lot of fun and it is a great way to explore color. As always, it's open for everyone to join in! 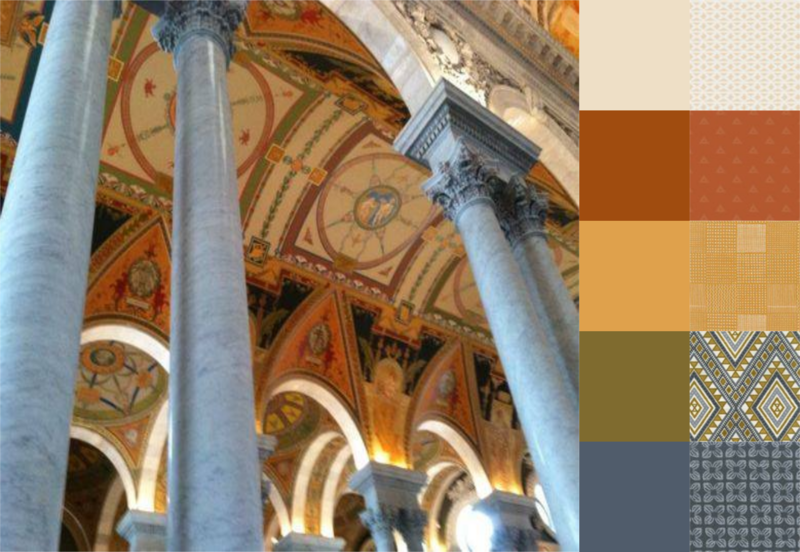 The photo this week is from the Library of Congress in Washington, D.C. This was a fun photo for me to work from. I read Dan Brown's The Lost Symbol over the summer. 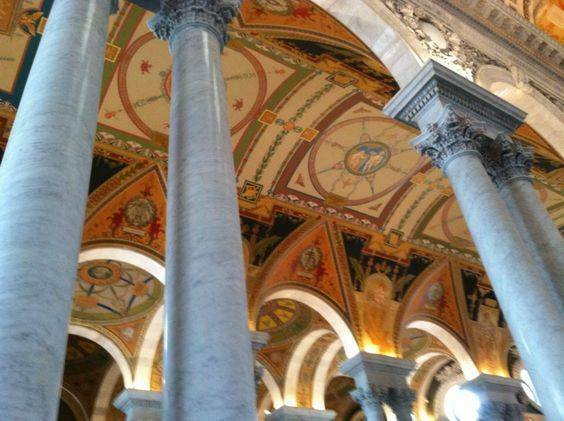 The Library of Congress and several other prominent D.C. locations are featured in the book. So it was a lot of fun to compare this photo (and other photos) of the library with the pictures I formed in my imagination. I've never actually been there and somehow I think the photos don't do it justice! This was one of the fastest CPF's for me! I couldn't believe it. Everything just came together so fast. The color palette has an earthy funk to it. I don't think I would have ever tried to put these colors together but they play with each other so well. 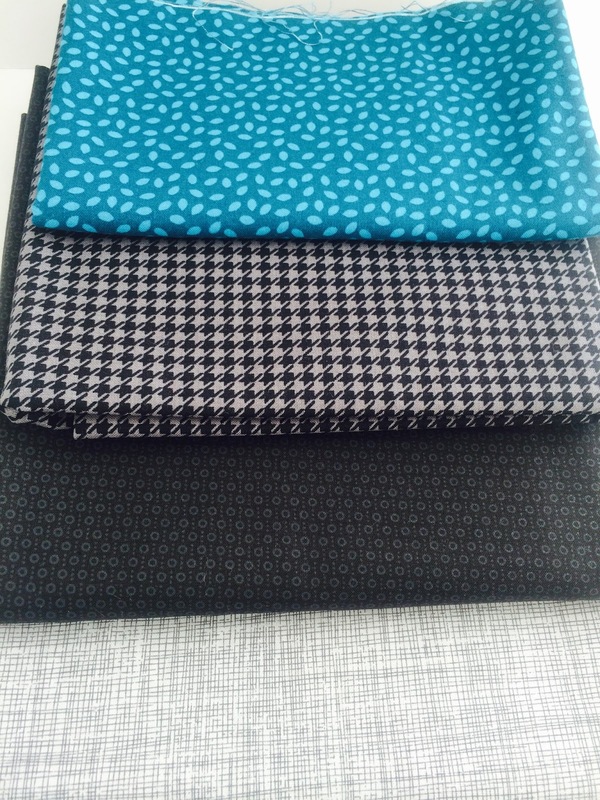 For the fabric bundle, I like to start with what I think will the the most difficult color to find. That way I get the hardest part done first and it's easier for the rest of the bundle to grow from there. I don't have a lot of luck with olive greens so that's where I started. After looking at only a few fabrics I found that great focus print and as a bonus it had that slate blue shade in it as well. Things just fell into place after that. If you are interested in playing along, you can find more info on how to join the CPF group by clicking either of the hosts' buttons on my sidebar. You can see my past CPF entries by clicking on the Color Play Friday tab in my menu bar at the top of the page! 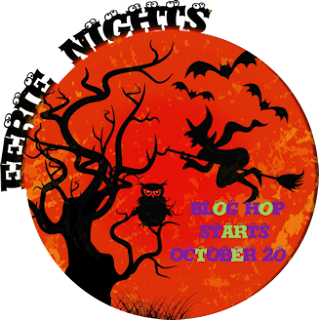 Eerie Nights Blog Hop - The Witching Hour and a Giveaway!!! 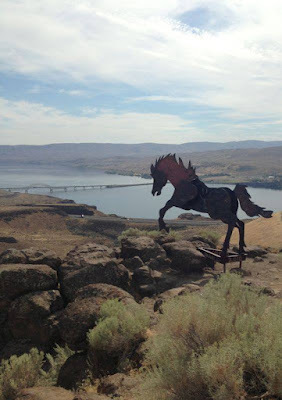 Hello and welcome to the Eerie Nights Blog Hop! The Eerie Nights Blog Hop has been going on for a few days now and there have been lots of spook-tacular projects so far! There are also giveaways! Yes, giveaways!!! 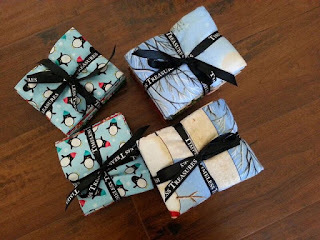 What's a Halloween themed blog hop without a few treats (no tricks) to give away? You can find the giveaway and links to all the hoppers at the end of this post! When I heard that Marian from Seams to be Sew and Amy from Sew Incredibly Crazy were hosting a Halloween themed hop, I knew I had to join in on the fun. A huge thanks to those two ladies for all their hard work organizing the hop and to the sponsors! Here is my quilt, The Witching Hour! When Mr. 123 Quilt saw this quilt he thought it looked like a time portal and he suggested the name The Witching Hour. The witching hour is said to be the time of night when witches, goblins, and ghouls are at their most powerful. It's the time of night when ghosts can pass between worlds. I don't know if I believe in ghosts... maybe they exist, maybe they don't. A few years ago, Mr. 123 Quilt and I were sightseeing and we came across an old cemetery. No one was around but the ornate iron gates were open and just inviting us to come in and look around. We spent 20 minutes or so wandering about. At one point, I stopped in the middle of the aisle to peer down at an old, faded headstone. I felt Mr. 123 Quilt come up behind me and put one hand on my back and the other on my arm and gently move me to the side, as if I was blocking the path and he wanted to get by. I said, "Oh, sorry, Honey," and looked up from the headstone only to discover that Mr. 123 Quilt was on the OTHER SIDE of the cemetery! We were the only two living people in that cemetery so I don't know who or what touched me and moved me aside. I've got chills just thinking about it. Do you have a ghost story? I would love to hear it! Anyway, back to my quilt. I knew that I wanted to make a Halloween quilt this year, so participating in the hop just seemed like a natural fit. I definitely wanted to make something simple and subtle; something that clearly had a Halloween theme but didn't scream werewolves and witches and vampires, oh my! (Not that there's anything wrong with that!) I found these great orange and black polka dot fabrics and I knew exactly how I wanted to use them. I added some solid black to the bundle and used a white for the background. In keeping with the subtle theme of the quilt, I quilted some very simple echo lines to really highlight the design of the quilt. For the quilting, I used Essential Thread from Connecting Threads in Black. I did all the piecing using the same thread in White. I really love their thread. It works wonderfully in my machine and I don't get a lot of lint (and no, that's not an affiliate link and I'm not getting paid to say that). I think this minimal quilting works really well in this quilt and I'm extremely pleased with how it came out! I used the orange on black polka dot fabric for the binding. I think polka dot binding is great... in theory. In reality a striped binding or a solid would have been better. I think the dots were just a bit too large to really get a good polka dot effect. Also, my binding seemed incredibly narrow this time around. It's the same binding I always do so I'm sure I'm just imagining things. Next time though, I think I will try to use a wider binding. As part of the hop, we were asked to not only show a new project, but to show some of our favorite holiday decorations. I've been just a bit sneaky and I've already shown mine! So there is a trick in this post! Scroll up a few photos. See that little white pumpkin? I love little ceramic pumpkins and I've started a small collection of them. I try to get a new one every year, but I haven't gotten one yet this year. I need to get on that! Unfortunately, most of my little pumpkins are in storage but I do have one more to show you. This one is sitting on my pile of trimmings from my quilt! I hope you enjoyed reading about The Witching Hour! I really had a lot of fun making this one. 123 Quilt -- That's Me!!! And now for the giveaway!!! Trick-or-Treat!!! Timeless Treasures is generously giving away a surprise bundle of fabric! Bundles shown may not be the same as the prize won. Use the Rafflecopter below and enter for your chance to win! Good luck and Happy Halloween!!! 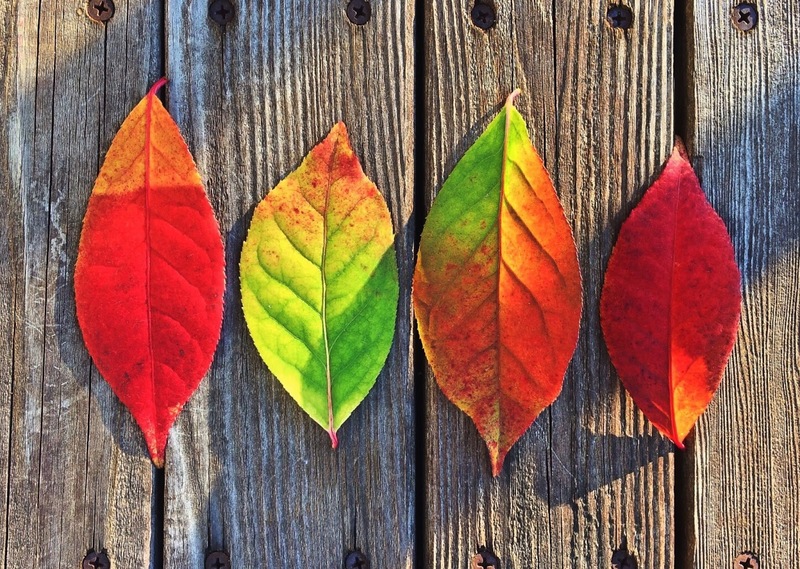 Hello and welcome to another edition of Color Play Friday! For those of you who are new, Color Play Friday (CPF) is a fun, weekly challenge hosted by Trina from In an Otter Life and Lorinda from Laurel, Poppy and Pine. Each week they provide one of their photographs as the inspiration photo and then the CPF participants create a color palette and a fabric bundle based off the photo. It's a lot of fun and the more people that play along, the more variations there are. And that's the best part, seeing what other people come up with! This week's photo is called Mukilteo. 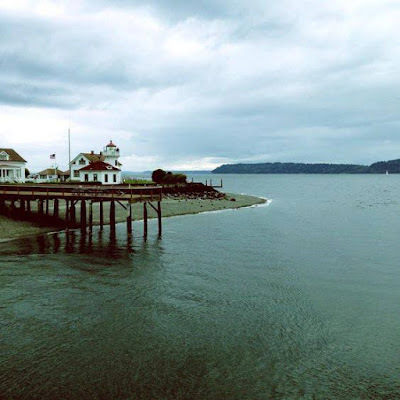 Mukilteo is a waterfront city in Snohomish County, Washington. In 2011, it was ranked number 9 on Money Magazine's top 100 places to live. (Thanks wikipedia for the info!) I believe this photo is of the lighthouse that was built in 1906. I really love all the blues and greens in this photo. Very evocative of sea glass, yes? I think so. I can just imagine walking along the shore and finding bits and pieces of old sea glass mixed in with the sea shells. 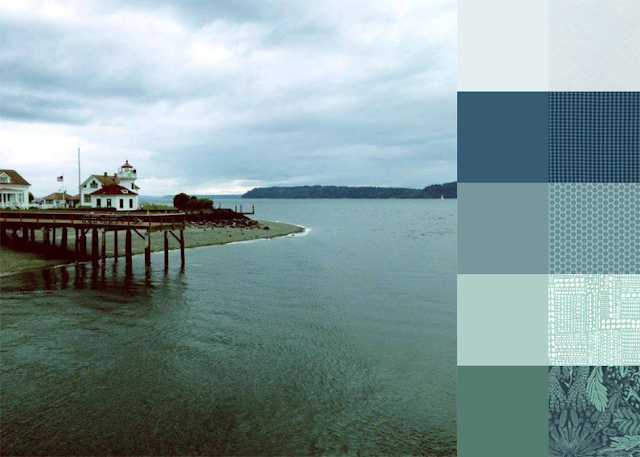 The palette was very easy to come up with this week. I debated putting some brown in there for a bit of contrast but in the end I decided against it. I just couldn't find any sandy browns that I liked. I "shopped" at Hawthorne Threads again this week. I really like using their color grid tool to look for fabrics. Yay for Fridays and yay for Color Play Friday! For those of you who may be new, Color Play Friday (CPF) is a fun, weekly challenge hosted by Trina from In an Otter Life and Lorinda from Laurel, Poppy and Pine. Each week they provide one of their photographs as inspiration and then the participants create a color palette and a fabric bundle based on the photo. Fall is definitely the word around here! Here is the weekly photo. Lorinda and Trina were taking a walk together last weekend when they spotted this gorgeous display of Fall leafage. They knew it just had to be a CPF photo challenge! Somebody get me hammer... cause I think I nailed it! Seriously, I am so in love with this bundle. It just makes me swoon every time I see it. 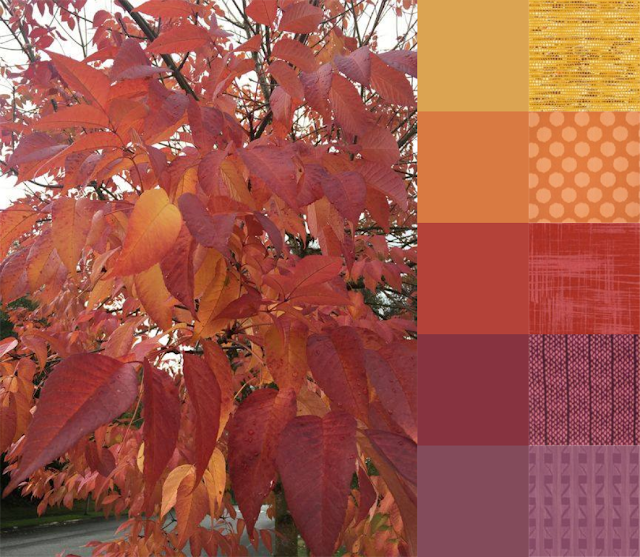 Can't you just see a fall quilt made with these fabrics? 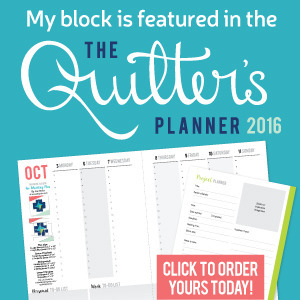 The gears in my head are turning and I'm going to get myself in trouble by adding extra projects to my "to-do" list. I will say that the purple thoroughly surprised me. 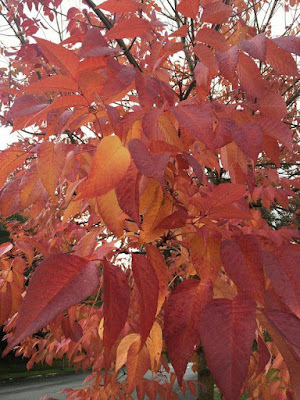 Somehow I never think of it as a Fall color but, lo and behold, it is! It took a while to find just the right purple fabric but the search was worth it. The yellow was just the opposite. I found way too many excellent fabrics in that ochre-y yellow that it was hard to narrow it down to just one fabric! 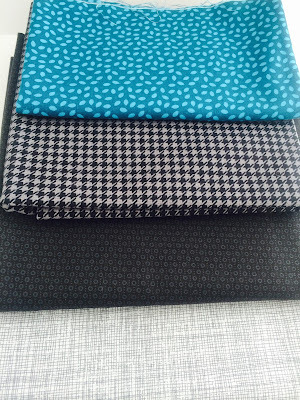 The rest of the fabrics were fairly easy to pick out. As always, you are more than welcome to play along! You can get more info on how to join the Color Play Friday group by clicking either of the hosts' CPF buttons on my sidebar. You can see my past CPF entries by clicking the Color Play Friday tab at the top of my blog.